Dal 5 al 7 Settembre 2016 a Valencia, Spagna, si svolgerà l'ottavo Congresso Internazione su Archeologia, Computer Grafica, Beni Culturali e Innovazione (ARQUEOLÓGICA 2.0). Il tema del congresso è "Documentazione 3D avanzata, modellazione e ricostruzione di oggetti beni culturali, dei monumenti e di siti. 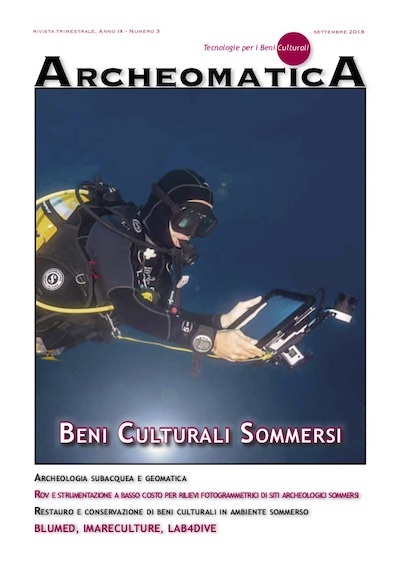 Ricercatori, professori, archeologi, architetti, ingegneri, storici dell'arte, dall'archeologia, la computer grafica e la geomatica, che si occupano di beni culturali, sono inviati a condividere la conoscenza e le esperienze nel campo dell'archeologia virtuale. E' molto apprezzata la partecipazione di ricercatori ben conosciuti ed aziende. Un programma attraente e interessante è predisposto per i partecipanti e visitatori. Gli autori possono contribuire in differenti modi: articoli scientifici peer-reviewed, work in progress, dimostrazioni. On behalf of the Organisation Committee of the International Congress on Archaeology, Computer Graphics, Cultural Heritage and Innovation ‘ARQUEOLÓGICA 2.0’, it is a pleasure to invite our colleagues from all over the world to come to the 8th Edition of ARQUEOLÓGICA 2.0 in Valencia, Spain, 5th – 7th September 2016. The lemma of the Congress is: ‘Advanced 3D documentation, modelling and reconstruction of cultural heritage objects, monuments and sites’. Researchers, professors, archaeologists, architects, engineers, art historians… from archaeology, computer graphics and geomatics dealing with cultural heritage are invited to share knowledge and experiences in the field of Virtual Archaeology. The participation of well-known researchers and enterprises is very much appreciated. An attractive and interesting schedule is arranged for the participants and visitors. ARQUEOLÓGICA 2.0 – 2016 is organised by the Spanish Society of Virtual Archaeology (SEAV), the Virtual Archaeology International Network (INNOVA), and the Universitat Politècnica de València in cooperation with CIPA Heritage Documentation. 1. Scientific peer-reviewed papers: Scientific peer-reviewed papers: Papers with a minimum of 5 pages (based on the MS Word Arqueologica2016_Template_DOI). They should report innovative and outstanding research works and activities. They will be assigned to oral or poster presentations after a review process (at least 2 reviewers per paper). The electronic proceedings (USB book with ISBN and papers with DOI) of Arqueológica 2.0 8th International Congress will be based on scientific papers. Some selected contributions, successfully extended, will be published in Virtual Archaeology Review (VAR). 2. Works in progress: Short papers up to 3 pages (based on the MS Word Arqueologica2016_Template) with figures. They should report on-going projects with some initial but interesting results. They will be assigned to poster presentations (both hard-copy and soft-copy fast-tract). All the short papers will make up the ‘Work in Progress’ book and will be included in the USB of the congress.